The government is expected to submit a bill to the current Diet session to approve the Japan-Australia Economic Partnership Agreement (EPA). Among the key agricultural items, rice will be exempted from tariff cuts, while tariffs on wheat, beef, some dairy products and sugar will be reviewed in the fifth year after the agreement takes effect. Are the measures under the agreement sufficient to minimize the negative impact on the domestic industry? Careful discussions are necessary in the Diet to approve the agreement, especially because the Diet resolution which called on the EPA to exclude key farm products from tariff eliminations or set them aside for future renegotiations has become a precedent for the Diet resolutions on the ongoing Trans-Pacific Partnership free-trade talks. The EPA bill was approved at the joint meeting of the Liberal Democratic Party’s Foreign Affairs Division and Headquarters for Regional Diplomatic and Economic Partnership, and is expected to be approved by the Cabinet on Tuesday, Oct. 7. Japan and Australia reached a broad accord in the EPA negotiations in April and the agreement was signed by Prime Minister Shinzo Abe and Australian Prime Minister Tony Abbott in July. The two countries agreed to conduct immediate tariff cuts for Australian beef, which the Australian side placed a strong focus on. But considering the competition between Australian and Japanese beef, the tariffs will be reduced step by step and separately for fresh and frozen beef. The tariff for fresh beef will fall from the current 38.5 percent to 32.5 percent, and then phase to 23.5 percent over 15 years, while the tariff for frozen beef will fall from the current 38.5 percent to 30.5 percent, and then phase to 19.5 percent over 18 years. Japan will have the ability to apply a discretionary safeguard and raise the tariff back to 38.5 percent if the import volume exceeds Australia-specific triggers within a given year. The government hopes to mitigate damage on the domestic industry by introducing a de facto low-tariff import quota for Australian beef. As for natural cheese for processing, Australia’s largest dairy export item, Australia-only duty-free quota will be set at 4,000 tons and will be expanded to 20,000 tons over 20 years, on condition that those who use imported cheese for processing also purchase a given ratio of domestically-produced natural cheese. This requirement has been given to secure demand for Japan-made cheese. Other key items, including wheat for human consumption, butter, milk powder, raw sugar and refined sugar, became subject to future reviews. 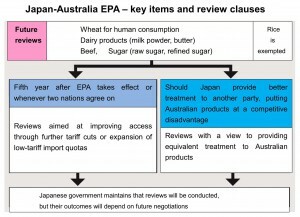 Reviews will be conducted for the items, as well as beef and cheese, under the following two conditions: a. automatically in the fifth year after the EPA takes effect and b. if Japan provides countries other than Australia a better deal in its EPA with them, putting Australian products at a competitive disadvantage in the Japanese market. The agreement notes that reviews under the condition b. should start within three months after the other EPA takes effect and be concluded within six months. The agreement says that review a. will be aimed at improving access through further tariff cuts or expansion of low-tariff import quotas, and that review b. will be aimed at providing Australian products equivalent treatment as their competitors, indicating that reviews will be implemented to increase Australia’s access to the Japanese market. At the LDP’s joint meeting held on Thursday, Oct. 2, some members raised a question of what could happen if, as a result of the Trans-Pacific Partnership free-trade talks, Australian beef is put at a disadvantage compared with American beef. Foreign Ministry officials responded that Japan and Australia can review their EPA in such a case, but added the outcome of the review depends on the negotiations, indicating that it does not automatically result in increased market access for Australian products. The agreement states that the beef safeguard mechanisms will also be reviewed in the tenth year after the EPA takes effect, or whenever the two nations agree on, to consider abolishing the safeguard or increasing the safeguard trigger levels, aimed at improving access to the Japanese market. 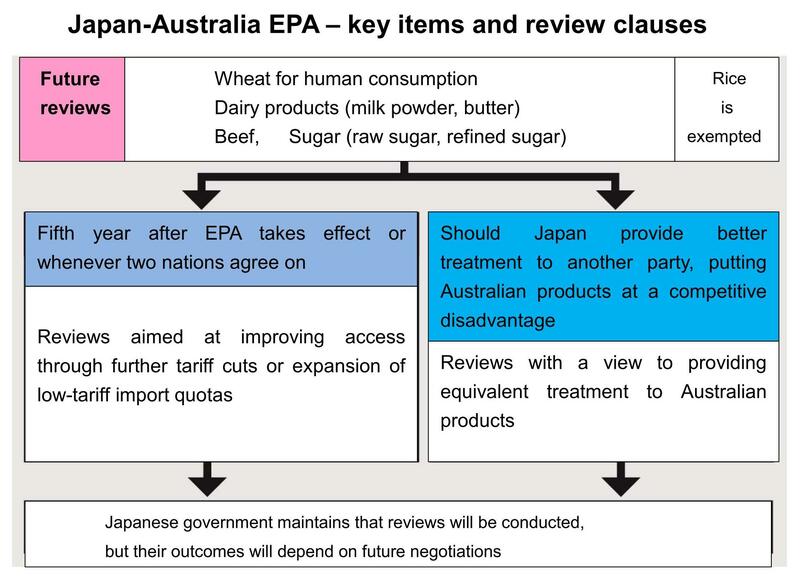 Before Japan and Australia entered talks for the EPA, agricultural committees of the Diet’s upper and lower houses called on the government to exempt key sensitive items such as beef from negotiations or leave them for future reviews. When the two nations reached agreement, then agriculture minister Yoshimasa Hayashi said the committees would be responsible for judging whether the EPA is consistent with their resolutions. The current Diet session will be the opportunity to evaluate whether the agreement meets the Diet resolutions. In April, the LDP’s agricultural committee judged that the government narrowly managed to protect Japan’s agriculture in the EPA, and adopted a resolution pledging to make the utmost effort to prevent damage which the agreement could bring about. It is necessary to carefully determine what kind of influence the agreement can have on domestic farmers and implement measures to support them if there is any negative impact. Especially, Japan’s dairy farming and livestock breeding are recently threatened by increasing number of people giving up the business and a sharp increase in feed prices, prompting the agriculture ministry to consider long-term policies to reinvigorate the industry. Such a serious situation should also be taken into consideration when evaluating the EPA. The key items, except for rice, will be under review in a few years after the EPA comes into effect. In future negotiations, it is necessary to make sure negotiators will not cross the red line which they have managed to draw in the agreement. The Diet’s resolution for the EPA has become the foundation for the resolutions made for the TPP talks, which call on the government to protect key agricultural products as a “sanctuary.” Thorough Diet discussions must be conducted on the EPA, as it will serve as a precedent for TPP negotiations which are in their final stage. This entry was posted in Food & Agriculture, Trade Talks and tagged Focus. Bookmark the permalink.